The European Environment Agency (EEA) was established in 1993 with the main task of collecting, organizing and disseminating reliable and comparable data for decision-makers and the public. IOWater, through its work of assistance to the French authorities in setting up information systems, had to know the European developments in order to ensure the necessary connection between the national level and the European level. In this context, the creation of the EEA is seen as an opportunity to get as close as possible to the information and networks needed to establish this link. This creation is accompanied by a significant use of external operators to carry out or assist in the realization of the Agency's tasks. In 1994, the EEA set up the Topic Centers, consortia of recognized organizations of the Member States to assist in its task of collecting, organizing and analyzing data and information on the main environmental topics it covers. Since 1994 and with the help of the French authorities, IOWater has been part of the consortium that has been selected to work on issues related to inland waters. IOWater has thus contributed to the evolution of information systems, or to harmonize and analyze data on polluting emissions in Europe. IOWater also participated in preparatory work for the implementation of the Water Framework Directive, with the European Topic Center on Water (ETC-Water) as it played a major role in defining and testing the main concepts and their articulation. Today, IOWater is still part of the ETC-Water consortium, designated for the 2014-2018 period, which includes 17 partners and covers the whole water topic. The ETC has the distinction of being able to act on behalf of - and participate in meetings and conferences as a representative of - the European Environment Agency. One of the functions of the ETC is to manage all the tools and data of Member States reporting on Community directives to the European Commission. It also has an expert’s role for the EEA and the European authorities. IOWater is recognized in the consortium as a key thematic expert on water information systems, monitoring and polluting emissions. 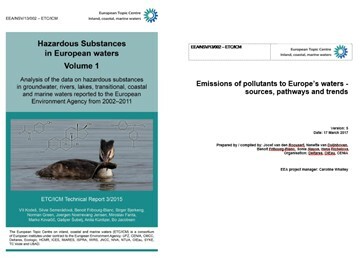 The tasks entrusted to it, in accordance with the EEA-specific planning, relate to the continuation of work on polluting emissions, water quality, data organization and application of the INSPIRE Directive. mobilize and process European datasets for national comparisons or for other needs.